You probably know Startup Institute for their full-time, 8-week bootcamps in Web Development, Web Design, Digital Marketing, Sales and Account Management. But with increasing demand from students who can’t quit their jobs in order to skill up full-time, Startup Institute is launching part-time programs in evenings and weekends. We asked Startup Institute Director of Admissions Sarah McLaughlin who the part-time programs are best for, how they differ from the full-time offerings, and how part-time students can achieve their goals without forfeiting their jobs. 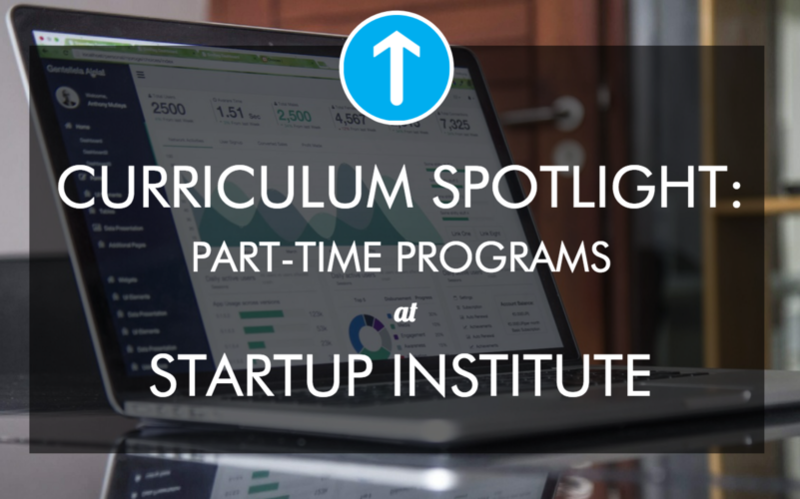 Why has Startup Institute decided to launch part-time programs? According to Gallup, 67% of employees in the US report feeling disengaged at work. Our mission at Startup Institute is to build an inspired workforce, because we know the world is a better place when people do what they love. Our full-time program has helped over 1,400 people transition their careers into the innovation sector. Students have come from backgrounds in law, politics, finance, teaching, administration and more, seeking opportunities in which they’ll be able to make a meaningful impact on a dynamic and solution-focused team. Still, the continuing education market consists of a variety of learners, and we have only been serving a small portion of them. There’s an added barrier for entry to our full-time program because it is intensive – it’s not possible to manage a full-time job while completing the program. During the admissions process, we frequently encounter people saying, “I would love to do this, but I don’t want to quit my job.” We needed to find a way to deliver our program to this broader audience. Startup Institute has always been about offering more than just technical skills. The part-time program remains true to what we are best known for: creating individuals with a growth mindset, who excel at cross-disciplinary collaboration. What is the structure and time commitment of the part-time program? Like the full-time program, the new part-time program will blend technical skill building two nights a week with networking events and two Saturdays a month focused on career-planning workshops, leadership and team skills, and cross-functional projects with local companies. It will also include eight additional weeks of in-person career coaching. Students should expect about 10 to 20 hours a week of work in total. The part-time program meets from 6pm to 9:30pm on Tuesday and Thursday nights for 12 weeks. It also meets every other Saturday from 8:30am to 5pm. In addition to class time, students will have the option of receiving one-on-one career mentorship and attending a number of evening networking events. They'll also be assigned lab work and projects to work on outside of class time. Who are the ideal students for the part-time Web Development program? What sort of students are you expecting? The ideal student for our part-time program is a person who is searching for a way to take their career to the next level, but doesn’t want to quit their current job in order to enroll in a full-time program. We have a triad of products to fit the needs of every skill-seeker: our Fundamental Skills Class for the person who’s in the early stages of investigating a new job function, the Full-Time Program for someone who’s ready to make a major career change, and the Part-Time Program for the individual who wants to level-up or stay relevant to their current employer. If your students are employed in full-time jobs already, are you expecting to see people skilling up for their current jobs, or career changers, or both? We’re expecting both. Our students in the full-time program have predominantly been career changers, but we’ve also had plenty of people who have come to Startup Institute to level-up their skills, build out their networks, and move into the innovation sector. We’re expecting the part-time program to attract a lot more of these people who want to level-up, but it may also be a more viable option for people who want to maintain a steady income while they transition their career. How will the admissions process differ from the full-time admissions process? E.g. will you be looking for different characteristics like time management or ability to balance commitments? Admissions for our part-time program follows the same rubric criteria as our full-time program. As with our full-time program, our admissions process for part-time is built to find students who will benefit from the program and learning environment. The interview is designed to find applicants who will be high-impact collaborators – the types of people we know entrepreneurial leaders want to hire. The next piece is about supporting the applicant to figure out the type of work that they will love. The interview and assessment involve a bit of searching for the “strike zone” to find a field that is interesting and energizing for them – in which the student will be solving the kinds of problems that their brain is really suited to solve. Time management skills and the ability to balance commitments will certainly be important qualities for part-time candidates, as well. It’s important to us to help candidates find the right fit for their career goals as well their learning style, so we spend a lot of time making sure people understand what the schedule, commitment, and content delivery look like. Will part-time students do the same 4-week pre-work module as the full-time students? Or will they have longer to work on it? Yes – part-time students will have the same pre-work opportunities available to them as our full-time students. That said, pre-work is customized and assigned on a case-by-case basis, depending on the learning needs of the individual. We’re prescriptive about what each student needs in order to be prepared to take on the program. Could you highlight the differences between full-time vs part-time curriculum for the Web Development track? The full- and part-time web development programs are very much the same. The curriculum content, teaching methodology, and career coaching elements are all the same. The main difference is in the schedule. Whereas the full-time program meets for eight weeks, Monday through Friday from around 9am to 6pm, the part-time program meets for 12 weeks. Two nights a week are spent building technical skills and every other Saturday is reserved for additional coding practice, plus career-planning workshops, leadership and team skills, and cross-functional projects with local companies. Ultimately, students will end up spending a similar number of hours in each program – in the part-time program those hours are just distributed over a longer stretch of time. A minor difference in the part-time program is that students do have one lead instructor from the tech industry who will deliver most of the curriculum over the course of the 12 weeks. This is different from our blended mentor-in-residence and ad hoc instructor model in the full-time program. Will students be required to do more homework/take-home projects for the part-time program than the full-time program? The curriculum for our part-time students will be the same as in the full-time program, but it will be of added importance that they practice and complete projects and lab work outside of class to successfully build skills and deliverables. Students will have access to their lead instructor outside of class hours on the cohort Slack channel, listserv, and in person by appointment. How many students will be in each class? Is this more or less than in a full-time class? As with our full-time program, part-time programs are capped at 60 people total. This usually works out to around 10-15 people in each skills track. Will students be interacting with students from other tracks for their projects as they do in the full-time program? Absolutely. The cross-disciplinary elements of our program create some of the highest value for our students in learning how to drive impact on a multi-functional team. It’s one of the things our students say they love most about our full-time program and will certainly be an important aspect of our part-time program. How will career services work for the part-time program compared with the full-time program? Will there be an evening Talent Expo so students can attend after work? That’s a great question. Our part-time graduates, like our full-time grads, will get two months of continued career coaching after the completion of the program to make sure that they stay on track toward their individual career objectives. If a part-time student joined us in hopes of getting a promotion, we’ll work with that person after the program ends to help them navigate those discussions with their leadership. If they’re looking for a new role, our staff members work diligently to help grads make connections and get the feedback they need to find a job they love. We’ll also have a Talent Expo for part-time graduates as we do for our full-time grads. We fill a room with hiring managers, founders, and CEOs, as each of our graduates take the stage to pitch their skills, ambition, and hustle in 60 seconds. What is your advice for students embarking on a part-time program? Any tips for getting the most out of it while balancing other commitments? A student from our most recent cohort in New York just wrote a blog post on his advice for our incoming students. I recommend it to anyone considering our programs. I would say, commit yourself to the process. Whether you choose to do our full- or part-time program, you’ve chosen to invest in yourself and in your career goals. Take time to be reflective about what these are – about where you’ve been and where you’d like to go. Take time to build meaningful connections and to invest the effort in your learning. The people who get the most out of Startup Institute are the ones who understand that the experience is what they make it. One of the things that makes Startup Institute unique is that people join the program with a range of goals and expected outcomes. For some people, building a network is the number one priority, so they'll devote the most energy to relationship building activities. Other people are intently focused on honing their technical skills. Between curriculum content, portfolio development, lab work, and the suite of exclusive online learning tools we offer, students could devote endless time and still not exhaust the resources available to them. We ask students to define their individual goals, and then we guide them in setting their priorities to meet these. So, there's not one set model. The experience at Startup Institute is designed to be as personal as the individual's unique career objectives. If you’re interested in our programs but aren’t sure which is right for you, feel free to reach out. We’re very focused on helping candidates discover if Startup Institute is right for their careers, and if it isn’t we say so – it’s important the fit is right on both sides. You can also download our Program Guide for more information on all of our course offerings.